"This is the day the Lord has made; let us rejoice and be glad! Alleluia!" If you are visiting family or home from college, we are glad you can join us today! Today we celebrate the most significant day of the church year, the Feast of the Resurrection of Our Lord Jesus Christ. We are saved, not by our own accord, but by the mercy of God. Jesus is raised from the dead so that we too may have everlasting life! We welcome Brandi Martin and Ashley Barth, the newest members of the Catholic Church and St. Rita, who joined us at Easter through the Sacrament of Confirmation. We extend our prayers and warmest welcome to you! 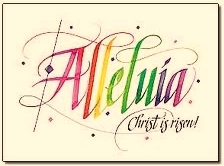 May this day and the days ahead bring you all much joy and Easter peace. May God bless you and your family this Easter! WHY DO YOU SEEK THE LIVING ONE AMONG THE DEAD? .... HE IS NOT HERE BUT HE HAS BEEN RAISED. Our Vigil Mass features four Old Testament readings that highlight many of the key moments in salvation history as well as a reading from the Letter of St. Paul to the Romans and a Gospel reading of St. Luke’s account of Easter morning. Our first reading is the creation story (Genesis 1:1-2:2), "In the beginning, when God created the heavens and the earth, the earth was a formless wasteland, and darkness covered the abyss . . . ." God created our world as we know it in a methodical, logical order ending by creating man and woman in his image. God gave man stewardship over all of God’s creation. The second reading is the story of God testing Abraham with the sacrifice of his only son (Genesis 22:1-18). Note the corollary between Abraham and Isaac and God the Father and Jesus. Isaac, like Jesus, must carry the instrument of his death on his shoulders. "Take your son Isaac, your only one, whom you love, and go to the land of Moriah. There you shall offer him up as a holocaust. . . ."
The third reading is the story of God parting the Red Sea so the Israelites could escape the Egyptians (Genesis 14:15 - 15:1). Moses prefigures Jesus leading us out of slavery to sin into new life. "The Lord said to Moses, 'Why are you crying out to me? Tell the Israelites to go forward. And you, lift up your staff and, with hand outstretched over the sea, split the sea in two. . . .'"
The fourth reading is the prophesy of the Prophet Isaiah near the end of the Jewish people’s exile in Babylon (Isaiah 55:1-11). Isaiah looks forward to the day of liberation, "All you who are thirsty, come to the water! You who have no money, come, receive grain and eat; come, without paying and without cost, drink wine and milk!" In our Epistle reading (Romans 6:3-11), St. Paul teaches us that as we also died with Christ, so too, we will receive new life in Christ, "We are indeed buried with him through baptism into death, so that, just as Christ was raised from the dead by the glory of the Father, we too might live in newness of life.,"
In our Gospel reading (Luke 24:1-12), St. Luke writes how the women were the first witnesses to the Resurrection. They found the stone rolled away and Jesus' tomb empty, "...but when they entered, they did not find the body of the Lord Jesus. While they were puzzling over this, behold, two men in dazzling garments appeared to them. They were terrified and bowed their faces to the ground. They said to them, "Why do you seek the living one among the dead? He is not here, but he has been raised." "You know what has happened all over Judea, beginning in Galilee after the baptism that John preached, how God anointed Jesus of Nazareth with the Holy Spirit and power. . . They put him to death by hanging him on a tree. This man God raised on the third day and granted that he be visible, . . . He commissioned us to preach to the people and testify that he is the one appointed by God as judge of the living and the dead. To him all the prophets bear witness, that everyone who believes in him will receive forgiveness of sins through his name." The Gospel reading (John 20:1-9) is St. John's telling of the events on Easter morning. Again, as in Luke’s Gospel, a woman was the first to witness the Resurrection. Note the deference given to Peter as the leader of the apostles. "Mary of Magdala came to the tomb early in the morning, while it was still dark, and saw the stone removed from the tomb. So she ran and went to Simon Peter and to the other disciple whom Jesus loved, and told them . . .They both ran, but the other disciple ran faster than Peter . . .When Simon Peter arrived after him, he went into the tomb and saw the burial cloths there, and the cloth that had covered his head . . .For they did not yet understand the Scripture that he had to rise from the dead"
Proceeds go toward the purchase chrome books for St. Rita School. Count It All Joy will be leading the music at the 5pm Mass on Saturday April 27 in celebration of Divine Mercy Sunday. The words of the songs we will be singing together in prayer are a reminder of God’s great mercy for us and the grace he bestows upon each of us to accept his great mercy. As you sing these songs, we encourage you to mediate on the Image of Divine Mercy and the words inscribed upon it, “Jesus, I trust In You”. O Blood and Water, which gushed forth from the Heart of Jesus as a fount of Mercy for us, I trust in you.” – Chaplet of Divine Mercy, from the Diary of Saint Faustina Kowalska of the Blessed Sacrament, "Apostle of Divine Mercy"
Calling all Grandparents/Older Adults you are cordially invited to join us in the Parish Center on Wednesday May 15th at 10:00 am. Enjoy tea, coffee, cookies and entertainment with the students. The dates for the 2019 Math and ELA test are now available. Only students in grades 3 through 5 take these tests. The NYS Science tests are administered to only students in 4th grade. Registrations are being accepted now. Prospective new families can either stop in the office for a packet or click on this link to Admissions---Registration for the packet.